After the World War II, however, France lost its know-how in high luxury production, and only a few prestigious models were left. The French automotive industry is 13th-largest in the world by unit production. Lately, France has been steadily climbing back to the top, making more and more sophisticated and powerful vehicles. Still, there have been almost no French car brands sold in the US in 25 years, since Peugeot, Citroen, and Renault left the North American market. Peugeot offers a wide range of models at competitive prices. Being one of the country’s economy cornerstones, it makes almost a million vehicles annually (in conjunction with Citroen). Peugeot managed to survive in spite of financial challenges, partly due to the fact that some of its production sites were moved to other countries. Many models from its range lack some of the modern technological options, but Peugeot has made a breakthrough recently. We can definitely mention 3008 crossover and RCZ coupe that set up new standards in style and performance. The popularity of Citroen among French car brands lately could be partly explained by its wise pricing policies. It offers a wide range of affordable and stylish vehicles. Also, this company is starting to regain its fame as the maker of excellent sports cars. C4 Cactus and DS5 models are definitely an example of engineering excellence. Quality, medium-priced sedans and SUVs have made Renault one of the most popular French car manufacturers from the EU to Asia. The product range varies greatly. In addition to top-selling sedans and SUVs (like Logan and Duster), it includes family cars (Twingo supermini, Espace MPV), practical Renault Scenic, as well as sports models. Bugatti Veyron Sports is sometimes named the world’s fastest car. Another Bugatti star is its 1500-hp Chiron – the hypercar claiming a top speed of 261 mph. Excellent design is one of the characteristics that makes Bugatti vehicles stand out in the crowd. The history of Bugatti had its ups and downs, in fact, it is the history of three separate companies that followed each other: Automobiles Ettore Bugatti (1909-1963), Bugatti Automobili S.p.A. (1987-1995), and the present-day Bugatti Automobiles. French brand Microcar was founded in 1984. Its urban 2-seat micro car Newstreet has a fixed demand among French youth. 16-year-old persons without a drivers’ license are allowed to drive this car model. There is a safety bow installed behind seats, which protects a driver and a passenger. The car can put on full speed 45 km/h. There are also two series of front wheel drive super compact cars intended for elder buyers in the program of the brand Microcar. The make Hommell refers to a super car created by an editor of a French car periodical specialized on motor sport and sports cars. The car was named after its creator Michel Hommell. The first model of Hommell was designed in the 1994. The make was engaged in creation of special cars for participation in the French action movie “Michel Vaillant: Need for Speed”. Three ears of wheat became the emblem of Hommell. It is a French-British car manufacturer. For this moment, the production of cars under this make is terminated and all rights for the make belong to the French concern PSA. The emblem of Talbot is a stylized image of the letter “T” in a circle. The engineer Bernard Cournil created a small firm that was specialized in cars` rebuilding in the city of Aurillac (France). Jeep cars abandoned after the war by troops of allies were adapted by Cournil for use in agriculture. By the beginning of the 60s, he produced his own transport vehicle meeting the requirements of farmers. It received the nickname of Tracteur Cornil. From 1960 until 1970, that car received a number of changes to match with actual norms. The changes happened to its heating system, seats, a speedometer was installed. 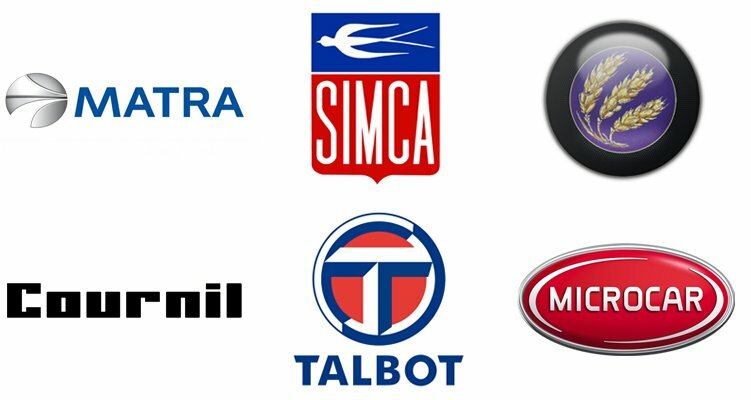 Simca is a French automobile industry company. The name Simca is an acronym formed from the full name of the French car maker La Societe industrielle et mecanique des constructions automobiles, which was founded in France in 934 by an Italian Henri Théodore Pigozzi, who decided to expand the market of sale of Fiat cars. The Simca emblem is a coat of arms base separated into a blue and a red background inside. In addition, the red background takes 1/3 more place than the blue one. There is a stylized image of a white swallow in the upper blue part of the emblem. The serial models and prototypes of Matra are rather an original page of the French cars` history. Racing cars and serial cars were produced under this make from 1964 to 2003. At present, Matra is engaged in the production of eco-friendly electric vehicles. It is a subsidiary of the company Lagardere S.C.A. ACMAT, Panhard General Defense (Auverland) and Alpine can be named among French car brands associated with Renault. ACMAT makes cross-country and tactical military vehicles, while Panhard General Defense is well-known for its armored fighting vehicles and four-wheel-drive cars resembling Jeep. Both are divisions of Renault Trucks. Alpine gained recognition for its racing and sports cars equipped with rear-mounted Renault engines. De Clercq, DeLaChapelle, Exagon Motors, SECMA, PGO, and Venturi should also be mentioned among minor French carmakers.